Special Holiday Hours, Shows, Camps and More! 'Tis the season to come to the Science Center and see our special holiday shows! We have 2 brand new full dome planetarium shows this year that are surely going to get you in the holiday spirit. 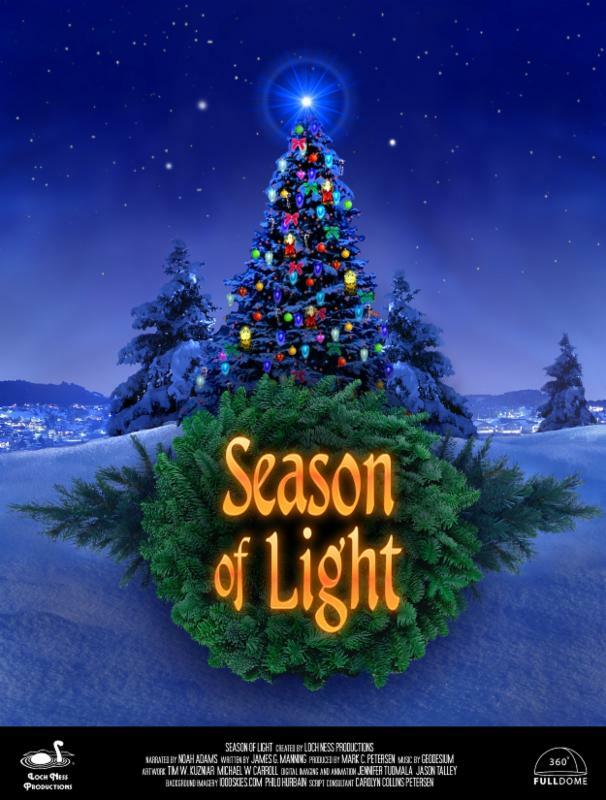 Season of Light explores the reasons humans are so fascinated with lighting up our lives during the December holiday season. It's an exploration of the astronomical meanings behind seasonal traditions, including the "Star over Bethlehem". This show plays at 1:00 pm Tuesday-Saturday. You can purchase tickets at the front counter or on our website. Our other brand new dome show "The Christmas Story" follows Mary and Joseph to search for a room in crowded Bethlehem. Stand before King Herod in his great palace, along side the three Wise Men from the East. Visit the shepherds and their flocks in a field and, in a stable, find the child in a manger. The Christmas Story plays at 3:00 pm Tuesday-Saturday. Purchase tickets here. We are also having a special showing of Let It Snow and Rock on Demand on Friday, December 16th at 7:00 pm and 8:00 pm respectively. This will replace this month's Rock and Roll Saturday. Let It Snow is a very family friendly show with great holiday and Christmas music set to graphics and animations on the planetarium dome. It is a great show to get the kids and whole family ready to celebrate the holidays. Our hours will be slightly changed during the winter break. We will be open Tuesday, December 20th - Thursday, December 22nd from 9:30 am to 4:30 pm. Then we are going to close down for the weekend for Christmas and reopen Monday, December 26th until Thursday, December 29th from 9:30 am to 4:30 pm. Last, but certainly not least, we are proud to offer day camps throughout the two weeks for kids who want to learn all about astronomy and space through hands-on activities both in the planetarium dome using our state-of-the-art software and hardware, as well as in our classroom with interactive demonstrations. Not only is it a great educational experience for children but it is also a great way for them to spend their holiday break. Camps are offered Tuesday, December 20th - Thursday, December 22nd and then again the following week from Tuesday, December 27th - Thursday, December 29th. The camps will begin at 9:00 am and last until 12:00 noon. Children are free to register for an individual day or the full 3 day week for a discounted price. Advanced registration is required and can be done at the front counter at the Science Center. Registration deadline is Saturday, December 17th. Hope to see you all soon and have a great holiday season!